Online sign up is now CLOSED! You can sign up on the day by joining us at 9am on Saturday 12 May at The Den, Teignmouth. Teignmouth…prepare yourselves and your washing machines…The Rowcroft Colour Rush IS BACK! The epic 5k that turns Teignmouth’s sea, sky and shores rainbow-coloured is back for 2018 and promises to be bigger, brighter and crazier than ever! Run, walk, or even dance your way around the 5k route while being showered with powder paint at three paint stations, all while raising vital funds to support your local hospice, Rowcroft, and the hundreds of Teignbridge families who receive our care and support every year! The 5k Colour Rush route starts and finishes at The Den on Teignmouth seafront. 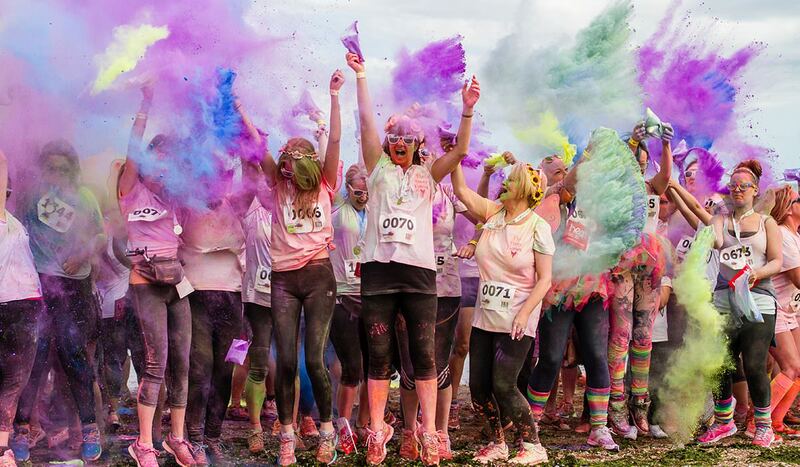 Once you’ve completed the 5k you’ll be invited to take part in Rowcroft’s legendary mass paint throw, and to enjoy an afternoon of live music from some of South Devon’s top bands and musicians! The messy madness will kick off from 9am with TWO TONNES of paint ready and waiting to be hurled, splashed and showered – it’s going to be big, bright and colour CRAZY! Want more information on how you can become extremely bright and colourful? Visit The Rowcroft Colour Rush page today!